Soccer formations and tactics are used to organize the players on the field, in order to improve the chances of tactically beating the opponent. Different clubs use different soccer tactics when lining up the players on the field. Many people don't really understand the importance of formations in soccer, and find it difficult to understand the importance of soccer field formations due to various reasons. Coaches often face difficulty when preparing for the game, since there are so many different soccer formations and tactics to choose from. The variety of different soccer tactics often makes Coaches complicate things by changing up their team system of play, thinking that the players will simply adapt to different positions on the field. This often results in confused players who have difficulty staying in their position, or knowing their job on the field. Every formation needs to be put in practice many times during soccer training sessions. WHAT ARE SOCCER team FORMATIONS? Soccer team formation is a blueprint of players positions at the start of the match, and the direction of movement throughout the game. Each soccer position compliments another position, to fill the space on the field, as the formation demands from players. Formations in soccer help Coaches with positioning the team and hide the weak spots on the field during the soccer match. Different soccer formations and tactics are used to position the players into more attacking, or more defensive roles on the field. Soccer tactics will set the rhythm of the game. Different formations will require use of short passing channels and building the attack thorough the middle of the field, while other soccer formations and tactics used in the game will call for utilizing the wings, and concentrating on long passing, and crosses. Keep it simple when choosing formations and tactics for novice, or beginner teams. 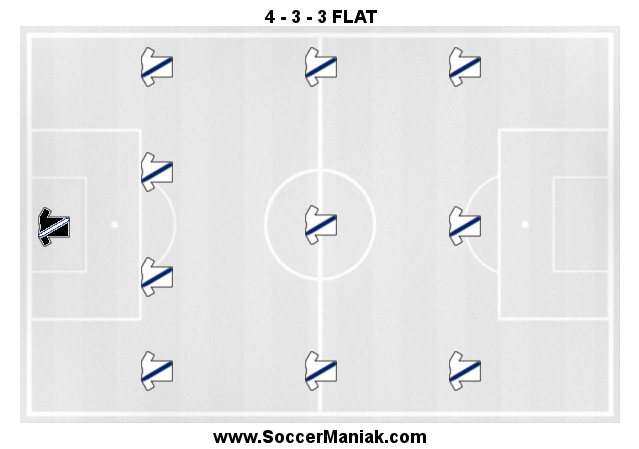 Formations for soccer can get very complicated and messy, very easy and fast. My advice to every soccer Coach just learning about the formations and tactics of play, is to focus on simplicity, rather than drawing different complicated formations on the board. Complicated tactics have to be trained often during practice, to make any impact in a soccer match. Players need to learn how to play this game, and feel comfortable with the soccer ball, before being introduced to different soccer tactics, formations and positions. Avoid confusing younger soccer players below 12 years old with different soccer tactics and formations. Simple 4-4-2 tactic will teach younger players to start respecting different positions on the soccer field. 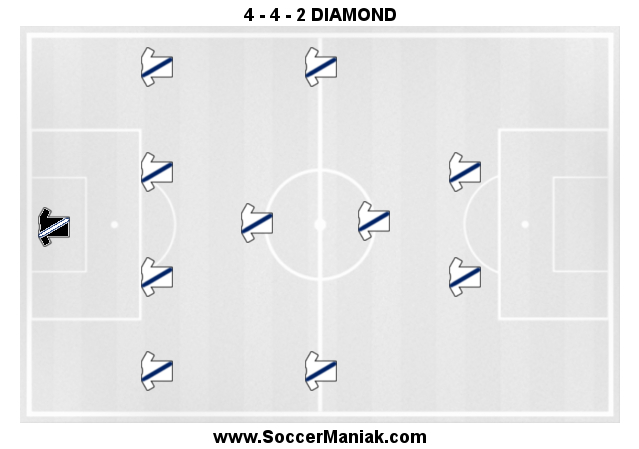 4-4-2 soccer formation is a classic, and most simple way to set up the players on the field. 4-4-2 formation will have 4 defenders, 4 midfielders and 2 forwards. More advanced club teams, playing competitive soccer at a higher level will use soccer tactics and formations as a weapon against their opponent. Coaches for more competitive clubs will study the opposition, and decide on the formation to use for the upcoming match depending on how the opponent is lined up. Soccer tactics come into play as the players get older, and have a better understanding of their positioning on the field. 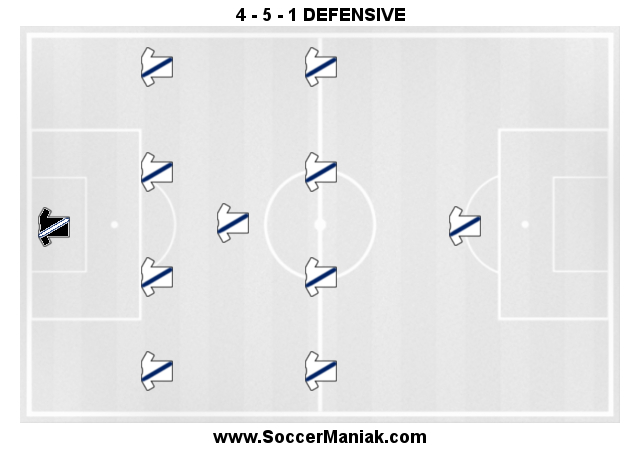 Coaches will learn the pros and cons of different formations in soccer, and the best way to apply specific formations for the right game situation. Every formation has positive and negative aspects to the game. Learning and studying different formations and tactics will lead to a better informed and educated coach. Educated coaches make every game tough on their opponent. The soccer field is very big, and knowing where to expose empty space is crucial to winning games. Great Coaches are similar to war generals. They study their opponents and exploit their weaknesses on the field of play (battle).